Description：Chinese State Councilor and Foreign Minister Wang Yi met with a visiting delegation of permanent representatives of the UN Security Council members in Beijing on Monday. 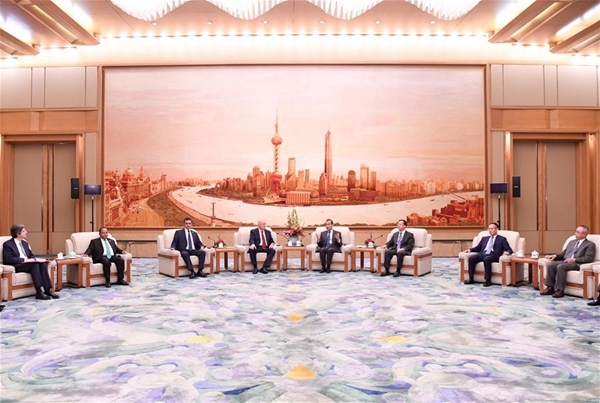 Chinese State Councilor and Foreign Minister Wang Yi met with a visiting delegation of permanent representatives of the UN Security Council members in Beijing on Monday. Calling the UN a symbol of multilateralism, Wang stressed that all parties should adhere to international rules such as the purposes and principles of the UN Charter to maintain the healthy development of multilateralism. He said that international society needed the UN to play a stronger role, and the Security Council, with the responsibility of maintaining international security and stability, should jointly safeguard multilateralism and international rules. "China firmly upholds the purposes and principles of the UN Charter, determines its position on the merits of each case, and is committed to boosting cooperation among the members of the Security Council," Wang said. The permanent representatives said they appreciated China's safeguarding of multilateralism, its support to the UN, and its outstanding contribution to UN peacekeeping operations and to promotion of global development. They expressed willingness to work with China to safeguard international peace and security.